Shares of Smartsheet, the Bellevue collaboration and project-management software maker, climbed after their initial public offering on Friday. Shares of Bellevue software maker Smartsheet surged on their first day of trading. The company’s stock closed up $4.50, or 30 percent, to $19.50 Friday. The initial public offering had been priced at $15 a share, raising $150 million from investors. As part of the offering, existing shareholders sold an additional $24.5 million worth of stock. 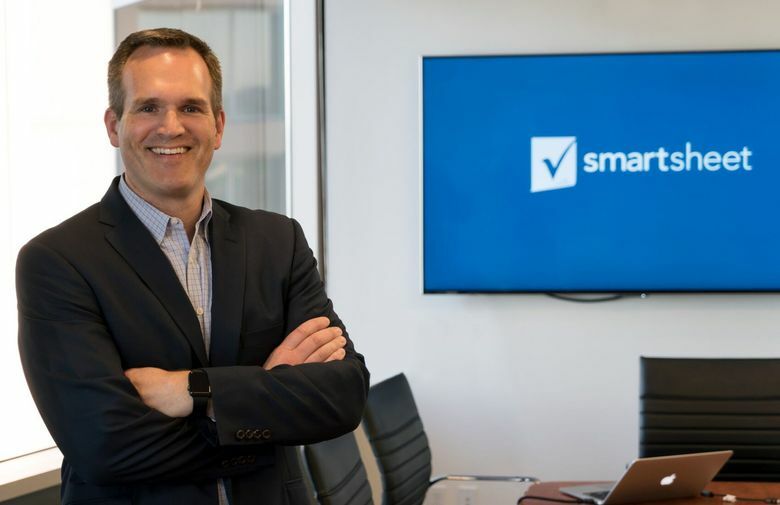 Smartsheet joined another Washington company that went public this week, Vancouver semiconductor company nLight, as well as electronic signature company DocuSign, which is now based in San Francisco but maintains its largest office in Seattle. Smartsheet, which makes collaboration and project-management software, brought in $111 million in revenue during the year ended in January, up 66 percent from a year earlier. The company, which has never turned a profit on an annual basis, posted a net loss of $49.1 million during the period, widening from a $15.2 million loss the prior year. The company at the end of January employed 784 people, 648 of whom worked in the company’s Bellevue headquarters. Chief Executive Mark Mader flew to New York to mark the stock debut, joined by a contingent of more than 50 employees, investors and board members. They broadcast the wait for the first trade live to employees in Bellevue, as well as Smartsheet’s other offices in Boston and Scotland. “I really underscored that without a team we have nothing,” he said of his comments to employees. Matt McIlwain, managing director of Seattle venture capital firm Madrona Venture Group, said it often takes several years to build software companies to a point where they are ready to enter the public markets. Thirteen-year-old Smartsheet was no exception. Madrona led Smartsheet’s first institutional investment round in 2007, and invested again in 2009 during the financial crisis when Smartsheet was redoing much of its software design. Smartsheet trades on the New York Stock Exchange, under the symbol SMAR.